After years of development hell and studio changes, the second Prey game is finally here. Time has seen it morph from bounty hunter-style FPS to System Shock spiritual successor, but has that PC classic influence carried on through the rest of its DNA? Is Prey a PC game for the ages, or will it suffer from the same performance issues as Arkane’s Dishonored 2? 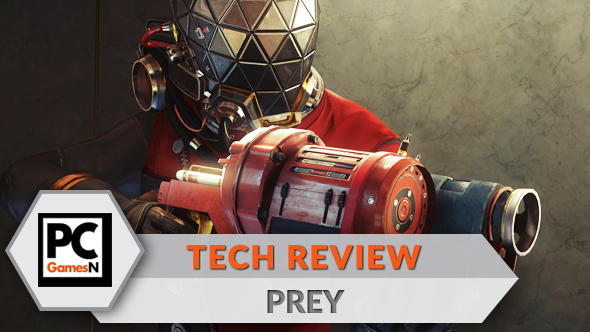 There’s only one way to find out: welcome to the experiment that is the PCGamesN Prey tech review. Related: the best shooters on PC. Our tech reviews are written to offer you the broadest picture possible, focusing on hardware similar to what the majority of players have installed in their machines. We test the game on all graphical settings using an i5 powered rig with 8GB of RAM, and try to hit 60 fps with four of the most popular graphics cards. Even if your PC is not identical to our test set ups, you should still be able to estimate the performance levels you can expect from your own machine. Unlike many big-budget games on PC, Prey has a rather slim collection of graphic settings. The seven options cover the core areas – shadows, textures, anti-aliasing, and anisotropic filtering – as well as more advanced tech like screen space directional occlusion and screen space reflections. While a few more granular settings would have been appreciated, it’s nice to see a couple of very specific options among the more generic ones. There is a very upsetting omission from the bunch though; an FOV slider. 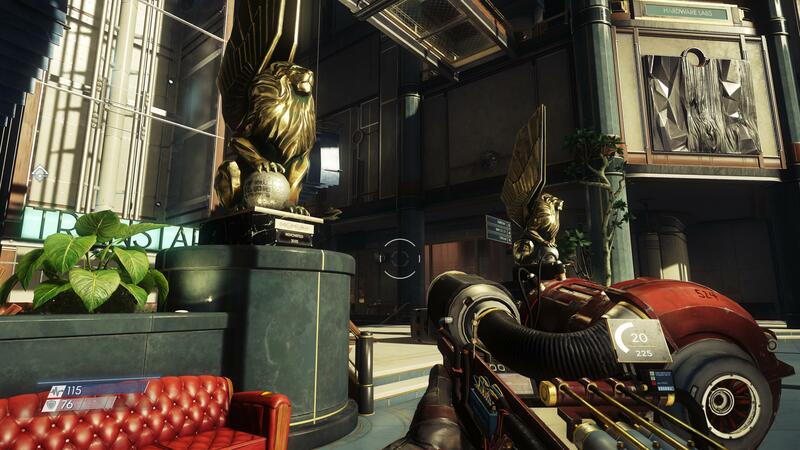 Field of view options are pretty important in the world of FPS games, but Prey is locked at 85 degrees. Arkane have thankfully reassured us that one is on the way, though, but last-minute bugs prevented it from being included at launch. For now, you can change the FOV using the game’s config file. In other menus you’ll find options to adjust mouse and keyboard inputs, including sensitivity, axis inversion, and a full re-mapping menu. Prey also natively supports the Steam controller, should that be your input of choice. For our graphics analysis we compare screenshots taken on the four standard presets of very high, high, medium, and low. 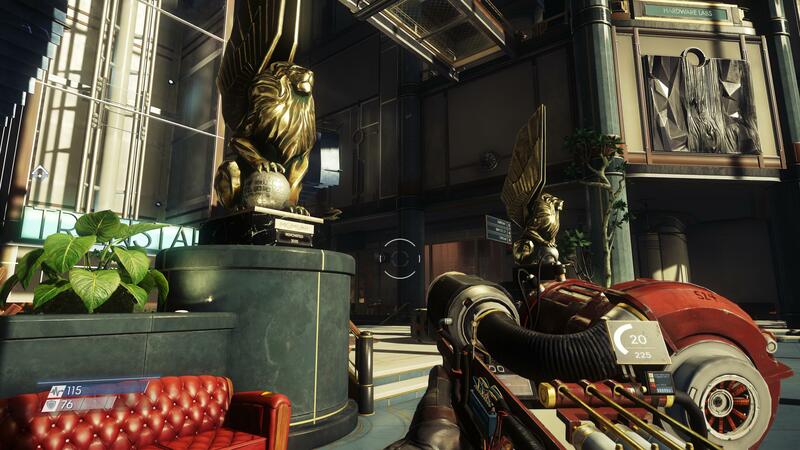 Bucking the trend of many recent releases, Prey does not require the game to be rebooted to apply new texture settings. There’s a loading bar you’ll have to wait for, but other than that in-game setting changes are quick and painless. Any game from Arkane is going to come with high expectations for art, and Prey certainly delivers. While it’s not the most technologically advanced game you can play today, it does possess a beautiful art style that’s not dissimilar to Dishonored’s ‘oil painting in motion’ look. You can see in the screenshot above a great variety of detailed models, from the exceptionally fiddly-looking GLOO cannon to the elaborate art-deco monuments decorating the Talos-1 lobby. Textures are hi-res, and the lighting reflects wonderfully on the correct surfaces, such as the marble pedestals and golden lions. The big question, of course, is what performance payment is required in exchange for these graphics? Well, I’ve got very good news. On my reasonable i5/GTX 1060 test rig, very high settings ran at an average of 107 fps. That’s a far cry from Dishonored 2’s infamous performance woes, and an incredible figure compared to even the best optimised games from this year. Arkane have worked wonders with the CryEngine to achieve this. Dropping down to the high preset results in a very minimal image change. If you look closely you will find that the texture resolution has definitely been lowered; the writing on the lion’s pedestal is a touch blurrier than before, and the edges of things in the distance, such as the signs behind the far lion, appear less defined. Aside from that, though, there’s very little change. The lighting is still great, and the general quality of the image is still very high. There’s a small increase in performance if you opt for these settings; the average frame rate jumps to 112 fps. If you’re using a similar PC to my test rig then it’s certainly not worth losing out on the crisper textures, but for anyone with older or lower-priced hardware those few extra frames may be very welcome. A drop in quality becomes much more obvious at the medium preset. You can instantly see that the texture on the drum of the GLOO cannon is far lower resolution than at higher settings; the 524 marking is smeared, the chipped paintwork is less defined, and more minute details look somewhat pixelated. The delicate brass work towards the back of the gun doesn’t have the depressed circle on the nut; instead it looks drawn on. Similarly, the marble detailing looks splotchy, rather than natural stone. The change results in a more notable performance hike, though. At medium settings you’ll find a similar rig to mine will produce 121 fps on average. While certainly not terrible, things do become notably ugly at low settings. Textures are so low resolution that things take on a ‘models painted by a seven year-old’ look, with splotches of red and grey making up the GLOO cannon instead of authentic metal and paint textures. The drum and fan unit looks positively circa 2001. A complete lack of anti-aliasing introduces jagged lines everywhere, notably on the marble ledge beneath the plant and lion. Shadows and lighting are far less complex, leading to an overall flatter image. Sacrificing all the bells and whistles results in an average frame rate of 133 fps, so you will see notable gains. 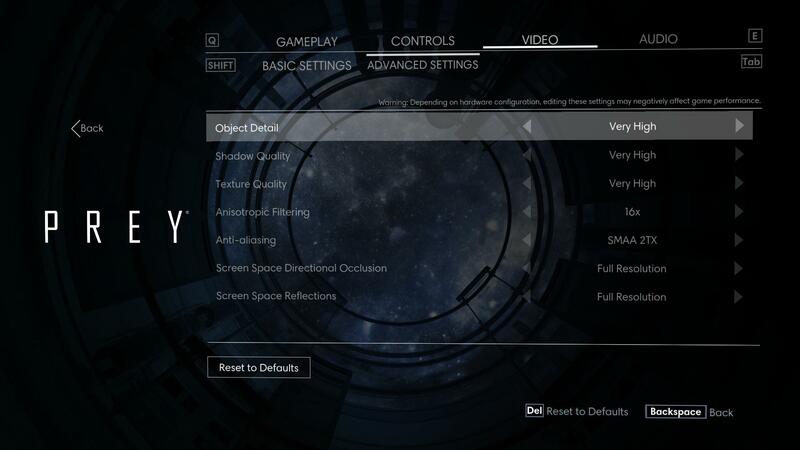 Considering how well Prey runs at maximum settings, though, these settings should be reserved for only those with the most basic PCs. To see how Prey performs on various hardware setups, we test the game on four graphics cards; two from Nvidia, and two from AMD. We’ve sampled the most popular cards from the current and last generation of GPUs in order to offer the most useful information. All four cards are tested at very high settings, with every texture option set as high as they’ll go and every graphical effect turned on. For the test we play a two-minute sample that involves walking, running, jumping, and ranged and melee combat. The same section is repeated three times in order to find an average. You’ll immediately notice how high Prey scores across all of our test cards. At max settings, even the cheaper last-gen AMD R9 380, 60 fps is left in the dirt. The modern favourite Nvidia GTX 1060 provides 100+ fps without breaking a sweat, while the lower-priced AMD RX 470 keeps up the pace with an average of 82 fps. These figures will come as a relief to anyone who was burnt by the performance issues seen in Dishonored 2. Despite having areas with similar levels of detail, Prey is simply a distinctly better performer all-round. Part of this will no doubt be due to the more interior-focused nature of the game’s environments, but much of it is likely down to the chosen engine. Prey runs on CryEngine, as opposed to the id Tech 5-based Void engine used for Dishonored 2. Perhaps opting for tried-and-tested technology this time has done Arkane a great favour. How does Prey run in 4k? Prey runs wonderfully at 1080p, but what if you own a 4K display? Our UHD test rig – rocking an i7 6700K CPU, an Nvidia GTX 1080, and displaying on an Acer Predator 4K monitor – copes respectfully. At a huge 3840 x 2160 resolution on very high settings, Prey runs at an average of 41 fps, and a minimum of 30 fps. While that’s obviously a far cry from 60 fps, it’s still a very playable frame rate, especially considering the solo, offline nature of the game. Naturally it looks great at such a resolution, so if you’ve got the power Prey is certainly a game you’ll want to see in 4K. If you’re running one of the cards we’ve tested you’ll no doubt be feeling pretty confident about your ability to run Prey at a great frame rate. 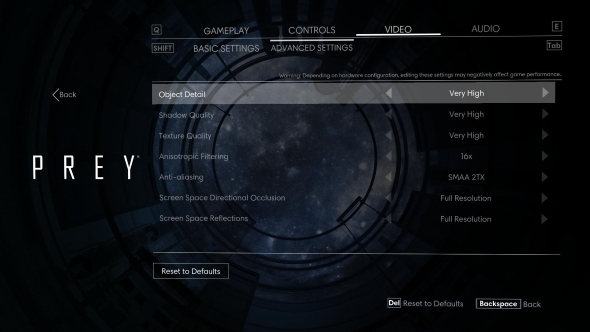 In this section I’d normally outline what kind of tweaks you’d need to make in order to squeeze an average of 60 fps from you GPU, but with Prey there’s just no need. Simply set the game to the very high preset, and you’ll be certain to experience a lovely smooth, high-end frame rate. Regardless of if you’re running a nice current-gen, mid-range card, or one of AMD’s older models, the above very high settings, with SMAA 2TX anti-aliasing and full 16x anisotropic filtering, will do you proud at 1080p. This excellent performance also opens up far more possibilities with higher resolutions; I found the same settings resulted in around 65 fps at 1440p. Back when Dishonored 2 released, I was one of a small number of people who managed to play without too many issues. But despite my experiences there, it was still easy to head into Prey expecting something to go wrong. There’s so much present in every environment – there are books, mugs, chairs, and computers literally everywhere – that it felt impossible that Prey could be anything less than an incredibly demanding game. What a joy, then, to be able to report that Arkane have created an incredibly well optimised immersive sim. Indeed, Prey is the best performing triple-A game I’ve played for many months. It’s incredibly rare to be able to boot up a game at maximum settings and get consistent reports of 90+ fps when using mid-tier hardware, but here we are. No matter how many benchmarks I ran, the reports came back clear and consistent: on a GTX 1060, an average of over 100 fps is easy to attain. It’s a win for Arkane, then, and a win for PC gamers. I’ve said before that Prey feels like a true PC game, and this performance analysis only cements that. As mentioned previously, I’m sure using CryEngine was a massive help, but I’d like to see Arkane eventually hit this kind of performance with their own Void engine, too. But if Dishonored’s tech put you off Arkane’s work, I completely encourage you to give them another chance now. Prey is something not to be missed, and it deserves to be played at its best on PC.